For the green beetles of southwestern United States and Mexico, see Figeater beetle. The Japanese beetle (Popillia japonica) is a common species of beetle. It is about 15 millimetres (0.6 in) long and 10 millimetres (0.4 in) wide, with iridescent copper-colored elytra and green thorax and head. It is not very destructive in Japan, where it is controlled by natural predators, but in North America it is a serious pest of about 200 species of plants, including rose bushes, grapes, hops, canna, crape myrtles, birch trees, linden trees and others. As the name suggests, the Japanese beetle is native to Japan. The insect was first found in the United States in 1916 in a nursery near Riverton, New Jersey. It is thought the beetle larvae entered the United States in a shipment of iris bulbs prior to 1912, when inspections of commodities entering the country began. "The first Japanese beetle found in Canada was in a tourist's car at Yarmouth, arriving in Nova Scotia by ferry from Maine in 1939. During the same year, three additional adults were captured at Yarmouth and three at Lacolle in southern Quebec." Japanese beetles have been found in the islands of the Azores since the 1970s. In 2014 the first population in mainland Europe was discovered near Milan in Italy. The life cycle of the Japanese beetle is typically one year in most parts of the United States, but this can be extended in cooler climates; for instance, in its native Japan, the beetle's life cycle is two years long as a result of the higher latitudes of the grasslands required for the larval stage. 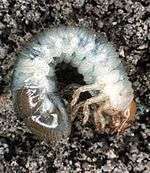 During the larval stage, the white grubs can be identified by their V-shaped raster pattern. Research performed by many US extension service branches has shown pheromone traps attract more beetles than they catch. Traps are most effective when spread out over an entire community, and downwind and at the borders (i.e., as far away as possible, particularly upwind), of managed property containing plants being protected. Natural repellents include catnip, chives, garlic, and tansy, as well as the remains of dead beetles, but these methods have limited effectiveness. 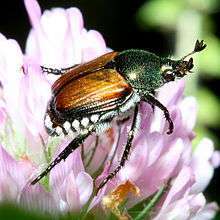 Additionally, when present in small numbers, the beetles may be manually controlled using a soap-water spray mixture, shaking a plant in the morning hours and disposing of the fallen beetles, or simply picking them off attractions such as rose flowers, since the presence of beetles attracts more beetles to that plant. Several insect predators and parasitoids have been introduced to the United States for biocontrol. Two of them, Istocheta aldrichi and Tiphia vernalis, are well established with significant rates of parasitism. Wikimedia Commons has media related to Japanese beetle. ↑ "Japanese Beetles in the Urban Landscape". University of Kentucky. Retrieved 28 September 2015. ↑ Paul V. Switzer; Patrick C. Enstrom; Carissa A. Schoenick (2009). "Behavioral Explanations Underlying the Lack of Trap Effectiveness for Small-Scale Management of Japanese Beetles.". Journal of Economic Entomology. 102 (3): 934–940. doi:10.1603/029.102.0311. ↑ "Japanese Beetle Ravages". Reading Eagle. p. 26. 22 July 1923. Retrieved 28 September 2015. 1 2 "Popillia Japonica (Japanese Beetle) - Fact Sheet". Canadian Food Inspection Agency. 19 February 2014. Retrieved 28 September 2015. ↑ Virgílio Vieira (2008). "The Japanese beetle Popillia japonica Newman, 1838 (Coleoptera: Scarabaeidae) in the Azores islands" (PDF). Boletín Sociedad Entomológica Aragonesa. 43: 450. Retrieved 28 September 2015. ↑ "First report of Popillia japonica in Italy". EPPO. Retrieved 28 September 2015. ↑ "Popillia japonica Newman, 1841" (PDF) (in Italian). Assessorato Agricoltura, Caccia e Pesca, Regione Piemonte. Retrieved 28 September 2015. ↑ "Managing the Japanese Beetle: A Homeowner's Handbook". U.S. Department of Agriculture, Animal and Plant Health Inspection Service. May 2015. Retrieved 28 September 2015. 1 2 "Japanese beetle control methods". Landscape America. Ohio City Productions, Inc. Retrieved 28 September 2015. ↑ "Tips on how to get rid of pests". selfsufficientish.com. Retrieved 28 September 2015. 1 2 Jeff Gillman (18 March 2010). "Disney and Japanese Beetles". Washington State University. Archived from the original on 14 March 2012. Retrieved 28 September 2015.